Earn $7.89 in Rewards credit (789 points) What's This? The Ultralight Wind Jacket from Showers Pass is an ultra-packable layer that offers the maximum protection for those unexpected shifts in weather. Featuring Elite Wind Fabric throughout, the PFC-free DWR coated jacket is windproof and water repellent to keep you covered on a fast-moving storm or gusty ride. Stretchy, seamless underarm side panels extend down to the wrists, providing a comfortable yet trim fit with added breathability. The fine touches of 3M Scotchlight reflective material provides incredible added visibility at night, keeping you seen. 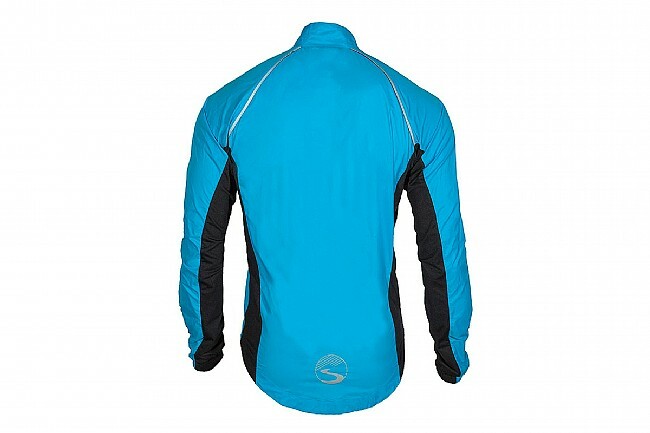 A dropped tail design adds coverage, and the assymetrical front zipper increases comfort while on the bike. When not in use, the Ultralight folds down into its included stuff sack, leaving plenty of room in a jersey pocket. Elite™ Wind Fabric blocks wind and light rain while letting excess heat escape. PFC-free durable water repellent finish (DWR) sheds light rain. 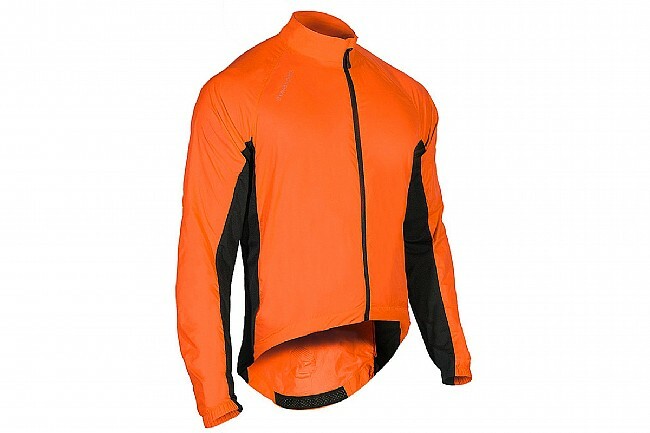 Jacket weighs only 5.8 oz /165 g (in size medium). Stretchy and seamless underarm side panels provide a comfortable trim fit). 3M Scotchlight™ Reflective Material for visibility at night. Silicone grip on dropped tail. Asymmetrical front zipper for comfort. Stuff sack included for easy packing. Height 0"-5'4" 5'5"-5'8" 5'9"-5'11" 6'0"-6'2" 6'3"-0" 6'3"-0"
Chest 32"-34" 35"-38" 39"-41" 42"-45" 46"-49" 50"
Waist 26"-28" 28"-31" 31"-34" 34"-37" 38"-42" 42"-48"
This is a great, very well made product. High quality seaming, fabric selection. Should be an easy 5 stars. Only issue i had with it was the excessive fabric at the waist. It flared out, not in. So the waist flapped like mad. I am not sure why it was designed like this? For this and only this only reason, i chose the Castelli Super Legera. For the rest, it.fit well and true to size. Ordered med. I am 162, 5.10,long arms, 39 chest, 32 waist. If it wasnt for the large waist, i would take this over the Castelli Super leggera any day. Much higher quality. Whilst I was not familiar with Shower Pass before this, I will definately consider their products in high regard from now on. Overall I very much enjoy this jacket. It's lightweight, comes with a stuff sack and protects you from the elements. It's the perfect size to take on a long ride if you need that extra layer but do not want to carry around a bundle all day. It's not race cut, but it's not a trash bag either. The usual Shower's Pass quality.